You’ll agree with me when I say there’s so much more that goes into parking your bike than most know. There are the issues of rust, corrosion, theft, and vandalism if you park it on the street. But if you’re like me, parking it in the garage causes more trouble than it’s worth. So, today, I’m going to share with you how I solved my motorcycle storage issues. Build Or Buy Your New Motorcycle Outdoor Storage? There are many reasons to invest in storage sheds for motorcycles. Your bike will stand a greater chance against would-be criminals, for one. A simple bike cover or open storage area will do nothing to deter thieves and vandals. Trust me: I learned this with my first bike. A locked shed places your motorbike out of sight. It also requires more of the criminal’s time and effort to access. 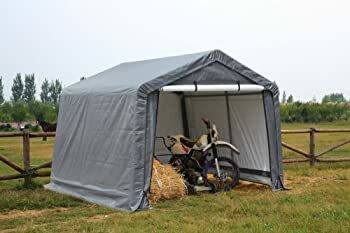 Aside from protection from other people, a motorcycle storage shed offers shelter from the weather. Many aspects of your bike can suffer from moisture and rapid temperature fluctuations. Your bike’s paint, rotors, and even the internal parts can suffer outdoors. This will lead to costly and/or frequent repairs down the line. In my personal experience, I found that storing my bike in the garage caused more trouble than it was worth. Trying to find ways to park the cars without blocking in my bike was impossible. When I tried to park it closer to the door, it sat too close to walls or other items. It made it difficult to pull out without dinging it. Not to mention, trying to work on it in the overfilled garage was a pain. Ever since I bought an outdoor building for it, though, I have my own place to work on it and store the tools, too. The best part is that I can pull it out whenever I want without playing musical cars or risking the paint job. 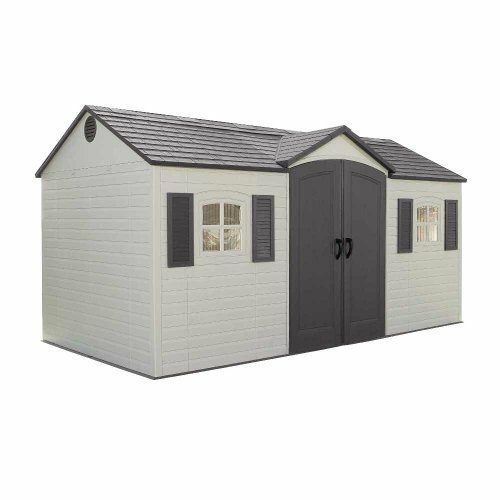 Depending on an assortment of variables, you may choose a portable or a permanent shed. A portable shed has its benefits, but a permanent shed offers the best protection. Designed to be lightweight for mobility, portable units consist of flimsy material. A portable building offers more protection than leaving your bike to sit out. I found that they get damp, though, and they aren’t insulated well. They offer around the same protection from the weather as a weatherproof cover. It can limit its exposure to the elements, but it’s still subject to temperature extremes. Unlike a weatherproof covering, a portable unit helps to conceal the bike. Everyone knows what’s under the weatherproof covering. Criminals have to investigate a building, though. 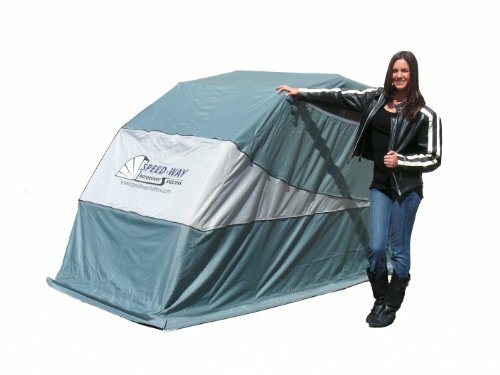 The same goes for a motorcycle storage tent. It’s made of an even weaker material but helps to keep most of the moisture from your bike. It also conceals it from those with ill intent. “Bubbles” are excellent to store your bike, although it doesn’t offer much in the way of hiding it. It’s best to use it alongside a tent or storage shed. Bubbles use a tough plastic polymer that resists fire damage and mechanical tears. They’re inflatable and easy to use, so you can store your bike for the winter in the garage without risking dings. When warm weather rolls back around, store the bubble and enjoy your bike. Permanent sheds offer the most protection for your bike. Think of where you’d most like to live: In a tent or a house? Not only does it better protect from weather, but it’s more criminal resistant. If you are planning to live in the same place long-term, then it’s worth it to invest in a permanent shed. There are pros and cons to each material with which you might build your permanent unit. With wood, there’s termites and plenty of maintenance. Metal is expensive. Plastic poses a significant security risk. On the other hand, wooden sheds offer the next best security to metal buildings at a fraction of the cost. The tradeoff is the maintenance is a little more than what you need to do with metal. Metal buildings are expensive for a reason. Their locks are more secure, and thieves aren’t getting in without making a lot of noise. This material also keeps out the most dust and weather. Plastic is the cheapest material. Though it keeps out the rain and conceals your bike from the street, it’s not Fort Knox. A determined criminal can break in with relative ease. 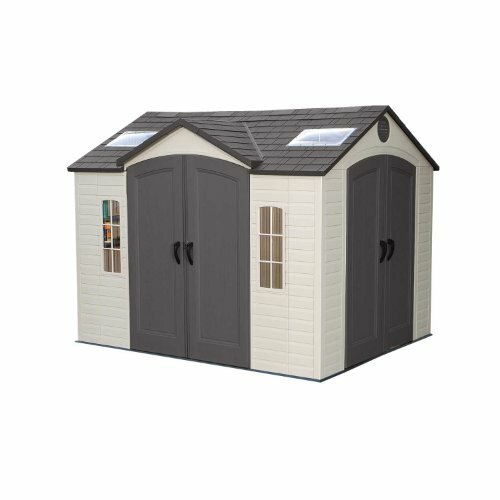 I mentioned plastic sheds earlier and this one from Suncast is one of them. It’s constructed of double-wall resin, a durable compound. This makes it lighter, but also helps it hold up better in storms. This resin is more durable than wooden sheds. It doesn’t rot and it holds up better against the weather. 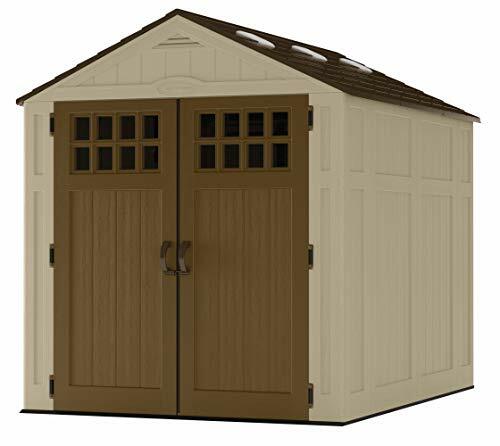 This shed is popular because, unlike a great deal of other storage units, it doesn’t leak. This is a nice change of pace considering that one of the chief concerns of plastic is the lack of sealing. It’s low maintenance, which is always a plus, and also comes with a skylight. The windows in this unit provide great ventilation, as well, staving off condensation. Strong metal reinforces most of the Suncast BMS6810D Everett, including the roof and floor. The handles come with their own built-in locks that go floor-to-ceiling. The left door allows for a padlock, as well, so it’s secure. It’s 306 cubic feet and is easy to assemble, although you might have some difficulty with the bolts lining up. Ensuring that the shed is built on a level surface may circumvent this issue. You will need to build your own foundation before putting it together. This polyester covering coated with polyurethane is best used along with indoor storage. Or, at least, not used over an extended period of time. Unfortunately, the weatherproofing wears off fast and it sustains sun fade in a hurry. It does offer an anchoring system, but you’ll need to attach it to something. Bolting it to a three-quarter inch plywood should do it. There is the option to lock the shelter at its base, which gives it added security. The polyester isn’t knife-proof, of course. The steel frame will stand between criminals who might try to wrestle the bike from the shelter. Speed-Way MTS Shelter is a well-made product, it looks unobtrusive and is easy to use. It can accommodate rather large bikes and you can use it right after a long ride. Yes, even while the pipes are still hot. Putting it all together takes less than half an hour. Now, though it may not be suitable for long-term outdoor protection, it will act as a great dust cloth. If stored in an open shelter that is somewhat protected from precipitation, it also holds up well. You can store it before it cools down. It may not hold up well in prolonged and/or extreme weather. The consensus for the Bike Shield is that it works exactly as advertised. It comes with a one year warranty and adds further protection with a galvanized frame. It not only repels water to the best degree possible but also blocks UV rays. This is a great product to protect your paint, leather, and chrome! They also included windows in this covering, allowing for proper ventilation. No condensation build up! There is a small gap at the bottom of the shelter, but it’s less than an inch. This does allow for dust and other debris to get inside the shelter. You will need to weight it when it’s not in use. It needs two people to assemble it with ease, but you can do it by yourself if you’re determined enough. 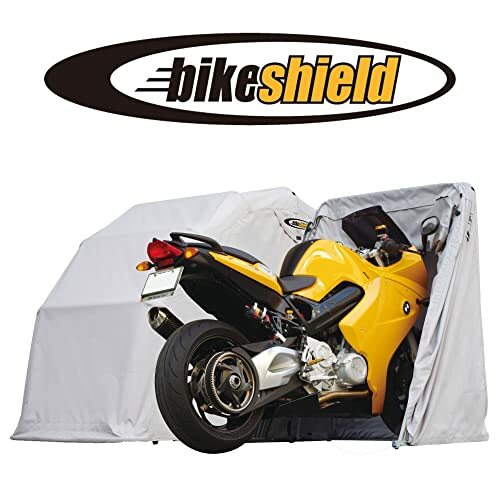 The Bike Shield tent-garage also allows for the owner to lock the frame with a padlock. The frame allows for a padlock. It can be difficult to assemble. The CarCapsule is a bubble made of PVC, a synthetic plastic polymer. The base is flame retardant and resists mechanical tears. Common garage fluids like oil or gasoline will not affect the base of this bubble, either. It uses a high-pressure fan to cycle the air within the bubble to prevent condensation. It seems that this is not always the outcome and moisture still collects inside the bubble in some cases. It inflates within a single minute and it does keep out all dust. The fan will cause some noise pollution, but it doesn’t seem to move the needle on your energy bill. The CarCapsule motorcycle bubble is big, about eight feet altogether, so it will take up a significant amount of room in storage. Bear in mind that you cannot push it against a wall, because you will be unable to open the bubble. The filter can be ill-fitted, but this doesn’t seem to affect the efficiency of the bubble. At least not in too noticeable a way. There is no way to lock the bubble, so anyone can access your motorbike. It’s best to use the bubble inside a locked unit. 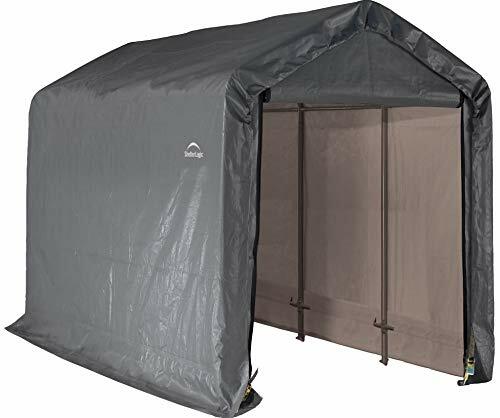 Lifetime Double Door Shed is made from plastic polymer with steel-reinforced walls and roof. The walls resist dents, though the interior may not be as durable as advertised. The windows are shatter-proof and also open for increased ventilation. Both the windows and the doors lock to protect your motorcycle. The polycarbonate skylight is able to withstand high-impact. Pest-proof screened vents assist in air circulation to avoid condensation build up. It’s low maintenance and resists fading and cracking from UV rays. You can customize it with expansion kits for shelves and such, as well, which is something you don’t see often. Be advised that you may need to take extra care to assemble this unit. The Keter Factor Shed is resin and reinforced with steel. It’s almost maintenance free and will not face in direct sunlight. 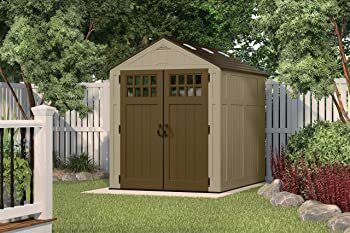 This shed comes in beige or brown, designed to look like wood. It has one window, which doesn’t open, as well as a skylight to allow for natural light. It’s equipped with air vents to promote air circulation. The security is basic, providing a place to use a padlock, but does not lock otherwise. You will need to build your own foundation to place this shed. Assembly takes anywhere from one hour to three hours, depending on skill. You may face a lot of difficulty with the instructions. The roof can occasionally blow off when faced with high winds. This problem can be avoided by anchoring it with ropes. When done properly, the roof withstands hurricane-force winds. 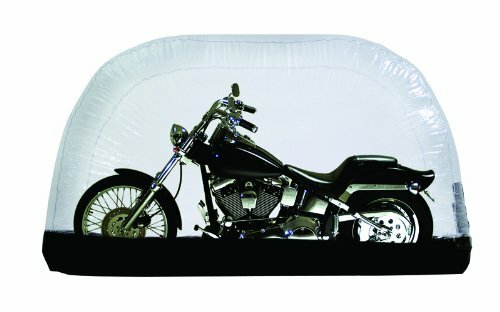 ShelterLogic Shed-in-a-Box Tent for your motorcycle uses a polyethylene material sealed with heat. Not using stitches increases its waterproofing. Despite the fact that it’s treated with UV blockers, it seems to break down in the sun. Sadly, it only lasts about six months to a year before the material fades and rips. The steel frame is durable, but it doesn’t come with a floor. You’ll need to anchor the tent to prevent it from blowing away in high winds. The walls of the tent will need extra reinforcement in high winds. The assembly of this tent is likely to cause you trouble. The instructions are difficult to understand. In general, it takes two people to put this together and it’s a strenuous task. There is no way to lock this tent. The best you can hope for as a crime deterrent is that it places your motorcycle out of direct view. This is another resin shed, but it’s a lot larger than the storage units we’ve covered so far. It has six skylights to allow for natural light and two windows made of polycarbonate. The windows slide up to open, too, so you can have added ventilation. The two vents built into this shed seem to do a poor job in the hotter months. 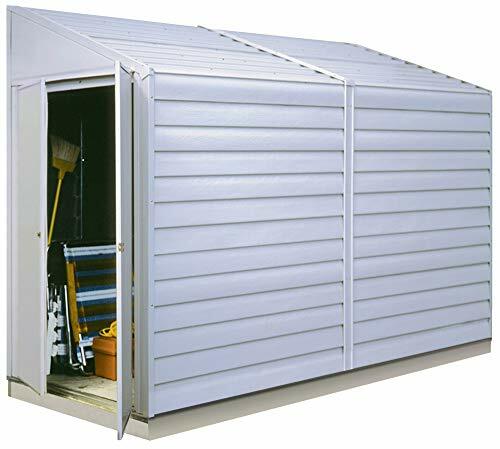 Lifetime Storage Shed Kit comes with four shelves in the corners, so you have more space to store items. It’s UV protected against fade and virtually maintenance-free. 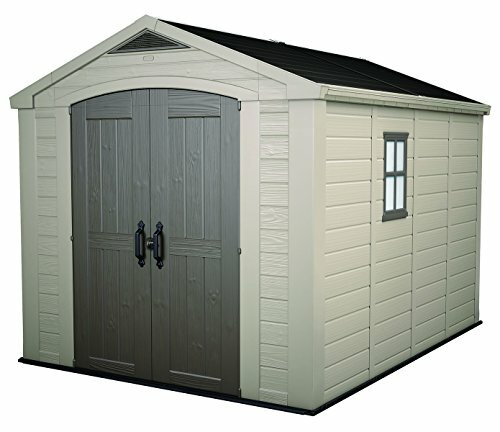 The steel reinforced walls and roof add durability and the shed comes with a ten year warranty. There’s a place for a padlock on the doors, as well, to provide security. This storage unit is known to withstand 70 miles per hour blizzards! To assemble it, it will take two people and a lot of attention to the complex instructions. This is a metal shed for your motorcycle. It’s made of electro-galvanized steel and resists corrosion in the weather. The sloped roof allows water and snow to slough away without collecting for long periods of time. This steel shed offers the option to add a padlock, adding extra security to an already powerfully resilient storage unit. This shed doesn’t come with a floor, so it’s essential that you build a platform. The company does offer a floor kit, but you’ll have to buy it separate from the storage building. The drilled holes may not line up when assembling it. The misalignment may stem from improper assembly due to complicated instructions. It seems to take around twelve hours for two people to build this shed. It is not something one can build alone with ease. This all-season motorcycle cover is pretty basic. It’s a bag-like cover that goes over your bike, then cinches at the bottom with the aid of elastic. The polyester is only built to withstand the mild weather. Don’t expect it to hold up in prolonged direct sun or extreme cold. It comes with a two-year warranty. A compression bag is included for easy storage and travel. The covering prevents condensation by way of a ventilation system. It even has a windshield liner made from soft material to prevent scratches to the glass. The bike must cool for at least ten minutes before using the covering. It’s easy to use this product, only taking a few minutes to store your bike. Security is nonexistent. There’s no way to lock it. The first thing you want to consider when choosing a storage unit for your motorcycle is your needs. Do you need room to work on it? Does the neighborhood allow for a shed? Do you need a contractor? The answers to these questions will help you choose a building that is the most aligned with what you want from it. As mentioned before, a sturdy outdoor unit will protect your bike from the weather. During the rainy season, it will avoid rust-causing moisture and corrosion. Freezing winters and blistering summers can have ill effects on your bike in more ways than one. The paint can crack and peel, and the chrome could even take a hit. And if you live in a snowy clime where they put salt down, you risk an accelerated possibility of corrosion. These are only a few of the issues the outdoors may have on your expensive motorcycle. Now, when you choose a shed for your motorbike, you’re going to want to make sure it’s the right size. I found that five feet by ten feet was plenty to store the bike and its accessories. I also knew that I wanted to have room to work on it, though, so I chose a larger size. Luckily, I had enough room to build the larger shed, but not everyone is so fortunate. Before you build a storage building, make sure you have enough room. You want to make sure you’re leaving enough room between buildings. Property lines are an essential factor as well. If you intend to move, you will want to make sure you build something that you can move without difficulty. You can always take your shed with you, but make sure it’s physically possible. If you plan to build the shed yourself, understand how much work and skill will go into it. If the assembly appears to be more work than you’d like to undertake, then consider a contractor. If you don’t want to hire someone to build it, then you could always buy one that comes pre-built. If you want something custom, then there’s no way around it. You’ll either have to do it yourself or hire someone. When building the shed, take care with concern to the ventilation. Poor air circulation is the leading cause of condensation build-up, which will result in rust. Floor and wall insulation is a big thing, too. You want to try to keep the temperature as even as possible, so the more insulation, the better. Neglecting this could be almost as bad as leaving it outside. When I built a shed for my motorcycle, I almost forgot to leave room for the ramp. My wife reminded me before I actually built it, so it gave me time to change the planned location. Don’t forget the ramp. Think of trying to lift the bike a foot or two off the ground and push it inside. It’s a pain, right? My built-in workbench is a dream, in my humble opinion, and I recommend building one for yourself. It’s the perfect place to store my tools and motorcycle accessories. Nobody wants to leave them on the floor, after all. It’s also a great place for me to tinker on parts when I’m performing maintenance. Honestly, I’m just grateful for the security my motorbike shed gives me. It’s got a lock, it’s behind four sturdy walls, and it keeps my bike clear of criminal temptation. As always, remember to contact your city before beginning construction. You want to make sure you don’t need a permit before erecting an accessory building. Building a shed on your property without a construction permit (when you need one) could result in fines. In some cases, the city may even order the destruction of your shed. Not something you want to face after spending time and money to build it. Plenty homeowners build sheds themselves. Building a shed by yourself instead of buying a pre-made unit gives you creative liberty. You’re in complete control of the project. You decide where it goes, what materials you use, and the size and style. It’s all custom built exactly the way you want it. The downside is that some homeowners aren’t experienced in construction. There’s also a good chance that you may not have the time or energy to complete the project. Buying a commercial motorcycle storage building can be the less expensive option. Not only that, but it saves you the time of gathering all the materials and lugging them back to your house. Commercial units may not have every bell and whistle you might have dreamed up, though. You might have difficulty finding the style and size you want to fit your property and your needs. You should think about your free time, skills, and budget before making a decision. Most sheds you buy will come with a non-slip floor already, but some do not. Either way, added safety precautions never hurt. Buying a couple of non-slip floor mats for your shed will help protect you from oil or other spill hazards. Falling in an enclosed space that is likely filled with dangerous tools can be fatal. Another accessory in which you might consider investing is tool areas. Shelving, drawers, tool storage and other such organizational areas will make your life easier. You will want to place these areas somewhere convenient in the shed. Nothing is more discouraging than having to climb over things to get to your tools. Plus, it’s going to slow you down when you’re trying to work on your bike. You can make your shed floor out of treated plywood, if necessary, but concrete works best. The reason plywood is the less viable option is because it can rot when in contact with moisture. Concrete may crack after a long time, but it is still more durable than wood. Also, concrete holds up better under the weight of heavy materials – such as a motorcycle. If you decide to use concrete for the base, then make sure to include a vapor barrier. Water vapor from the soil can permeate the concrete, resulting in rapid deterioration. Cross-laminated vapor barriers made from virgin vinyl tend to hold up best. The concrete slab you use should have steel reinforcements to further prevent breakage. A well-ventilated shed prevents condensation build up on your motorcycle. Condensation sitting on your bike will result in corrosion and rust. In some cases, it may cause mechanical issues. 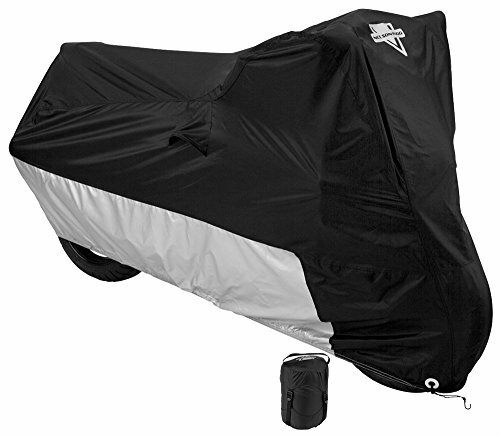 Cover your bike with a motorcycle cover, even if storing it inside. This will prevent dust from settling on your bike and provide more protection. The cover should not be cotton, as that material collects moisture. When storing your bike for a long period of time, such as winter, use a fuel stabilizer like Stabil. Gas can go bad in as little as 30 days, so to prevent that, it’s best to use a product designed to keep the gasoline fresh. Use carpet under your bike when storing it. This adds protection from moisture. It also protects your bike’s tires from getting flat spots from sitting too long. Your motorcycle battery may lose its charge if stored for a long period of time without use. It’s best to bring it inside to prevent having to charge it again in the spring or summer. When storing your bike outside, even in a shed, it is vulnerable to pests and critters. Stuff an old rag in the exhaust to prevent anything from crawling inside your bike’s pipes. Or creating a nest you’ll have to deal with in the spring. To ensure that any condensation that reaches your bike doesn’t corrode the chrome, spray it with WD40. This will preserve the finish. Whether you have a plastic shed or a metal one, make sure that you anchor it. It will help it survive storms a lot better. When you anchor it, make sure to lock it to something strong or to sink the anchor beneath the shed. If your shed can lock, make sure it’s locked after every use. If there are gates leading to your backyard where you set up your shed, make sure you lock those as well. A ground anchor is a perfect way to secure your shed. It’s a chain or other strong point that you bury deep into the ground beneath the shed. You fill the hole with concrete and attach the shed to a protruding D-ring. I used a twenty-four-kilogram kettlebell to secure my bike. It’s impossible to pick up because it’s too awkward when attached to the bike. The D-lock on it makes it to where a criminal can’t even get their hand around the handle. We covered a lot of information in this article. We talked about the importance of security and the ways that the outdoors could wreck your expensive bike. Of all the products we reviewed in this article, the best motorcycle storage solution is the Arrow Yardsaver. A metal shed just offers the most security. It’s also tougher against the elements, too. Of course, needing to purchase or build a floor can be a turnoff, but it’s definitely one of the better ways to provide security for your investment.